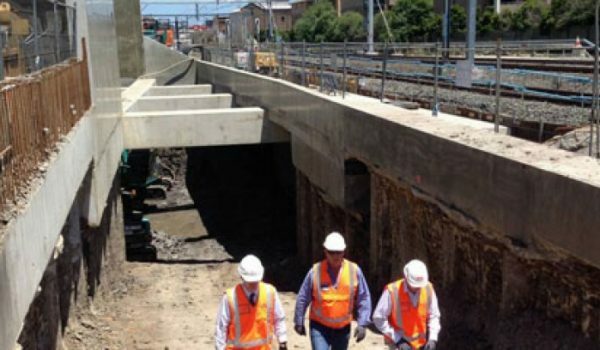 The North Strathfield Rail Underpass Project (NSRU) is part of a joint Commonwealth and NSW Government project. The goal is to deliver faster, more reliable service on the main rail line that runs from North Strathfield to Newcastle. The underpass will replace the junction at North Strathfield, a point where there is often freight congestion. As this is a government project, the NRSU Alliance works to strict environmental standards. They must maintain more than 80% recycling recovery on construction waste, and provide quality reports to confirm that these targets are met. The Alliance wanted to deal with an Australian-owned company with a track record of environmental responsibility. Grasshopper fit the bill. Our recycling facility was inspected by the Alliance’s environmental engineer to confirm that we handle waste responsibly. Construction for this project is on a massive scale, with waste collection points spread across eight separate sites over 3 kilometres. Because the project is in a residential area, Grasshopper has to work closely with the Alliance’s traffic management team, so our deliveries and removals happen within a precise window. Each of our drivers was inducted onto the site, and used the Alliance’s radio communications protocols, so we integrated seamlessly into the project. "They’re prompt. They’re courteous. They’ll ring you up and tell you what’s happening. The guys from Grasshopper will get in and service your site as quickly as possible."